Find out how these women worked to bring GMO labeling to their states. Find out what happened when Elle Cochran visited a Monsanto research farm. 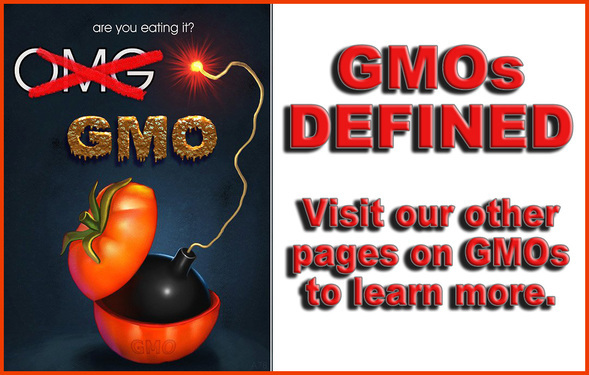 GMOs for Dummies here. We put it all together for you. Info clicks without searching. Pesticides DO NOT just wash away, you eat them. Click to find out what's happening. Know which ingredients are GMOs. Memorize this list below and DON'T BUY foods with these ingredients as they are most certainly GMO ingredients. Results of the French GMO cancer study here. STAY OUT OF OUR FOOD MONSANTO, WE DON'T WANT YOU THERE.